Even with some negatives, the New Year was fun, and friends and family are safely in 2010. In the past week or so I’ve found my way back into the 1960s again. My family has often told me that I should have been alive in the 60s for the civil rights movements and such because I have always been a big believer in not only equal opportunity for all, but also peace love and happiness. Heck, in sixth grade I wore a necklace with a peace sign around my forehead at recess most days. I’ve also always loved Jackie O’s look and could already qualify for old lady status with my affinity for the cardigan sweater. Hairspray and Across the Universe totally have me swooning for every outfit, but one thing that I never really got into (because I’m not really patient enough to deal with it) is the hair. I love the look, but it’s just not really worth the effort for me. 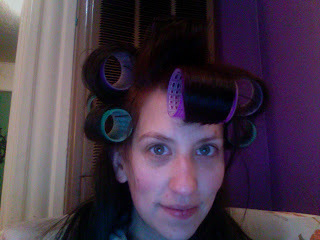 That is, until I pulled out the velcro rollers that I bought a few years ago. I played with them a bit then, but didn’t really get into them. This week though, I’ve used them several times, and they’ve been popular! The big hair is a hit with the one I wanted to impress in the first place, and I’m getting the hang of finding a way to get just the right results from them! 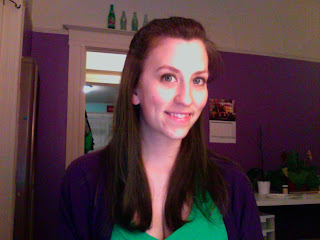 I actually think I might see about getting some hot rollers and trying those too! I don’t have a good picture of the big hair without it all pulled back and not so big yet, but I do have a picture of the rollers! Maybe tomorrow’s hair will be worth a photo!